The artisan market of El Zacatín is held throughout the year on the first Sunday of each month between 10.00 and 14.00. El Zacatín is an atmospheric and popular artisan market, taking place in the centre of town in the Plazas Vieja and Castillo and was one of the early pioneers amongst the artisan markets of the region. It has a practical blend of local food goods, including wine, cheeses, delicatessen, wood oven baked bread and cake products and local honey, as well as ceramics, wood, jewellery, glass leather and other seasonal specialities. Each month the market celebrates a specific craft, with demonstrations, tastings and dedicated displays, also being part of the annual fiestas when the first grapes are pressed and the market is filled with atmospheric folk dancing and music, and the tasting of the first sweet mosto ( fresh grape juice ) of the season. El Zacatín January: Music, featuring the ethnic musical groups which are so much a feature of Murcian country life, with the Cuadrillas and rondallas, amongst them the "Cuadrilla de animeros y auroros" and the "Rondalla" from La Copa de Bullas, a pedanía within the municipality, which has a strong tradition of folk music..
El Zacatin February: Medieval market. Revival of the concept of a mediaeval market, with jugglers, artesans dressed accordingly and working blacksmiths. El Zacatin March: Gastronomy. Murcian gastronomic traditions are celebrated with the preparation of traditional dishes, including Migas, the calorific combination of flour and olive oil so beloved of Murcians in the colder areas of the North-west. El Zacatin April: Natural aromatics. Celebrating the art of distillation which was such an important industry here during the 19th and 20th centuries. El Zacatin May: Esparto weaving. 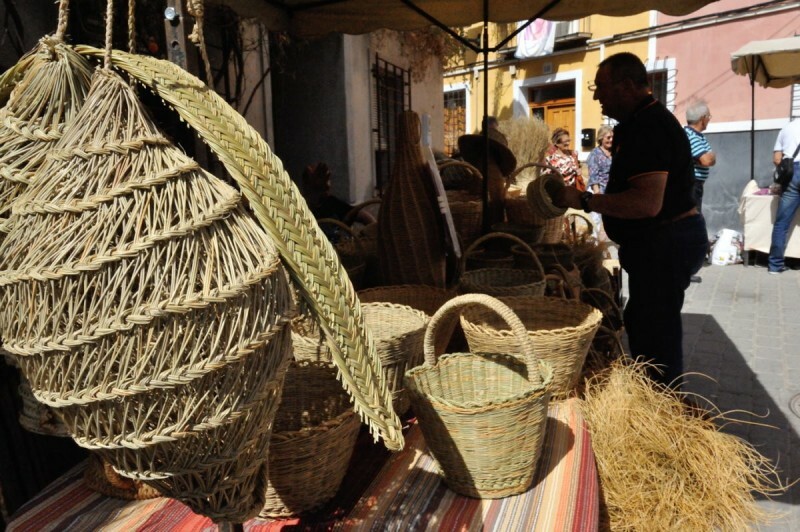 The esparteros, masters of this traditional art, show how important the use of esparto grass was in daily life, for baskets, ropes, shoes and daily home use. El Zacatin June: Flavours of the earth, featuring honey from the hives on the Murcian hillsides. El Zacatin July: Carpenty. Local carpenters demonstrate the use of wood in artesan traditions. El Zacatin August: Ceramics. A tradition for ceramics has existed for thousands of years in the Region of Murcia. El Zacatin September: Textiles. Textile production and elaboration was a part of daily life for those living in the countryside of Murcia. El Zacatin October: Wine. Wine is the most important agricultural product in Bullas, and is the core of the local economy. This month shows the preparation of mosto, fresh grape juice and the processes used in the elaboration of wine. El Zacatin November: Fresh dairy produce. Cheese from goats and sheep has always been a mainstay of the Murcian diet, and the hillsides of the North-west are important grazing grounds for both livestock. Fresh soft cheeses, and harder cheeses with the flavour of wild thyme and rosemary are both popular Bullas favourites. El Zacatin December: Christmas. Sweet pastries and sweets are produced specifically for Christmas, washed down with Bullas local D.O wines. Daily news and Whats on for the whole of the North-west area are mixed together in the North-west section, accessed via the header tab at the top of every page, or the map box at the bottom of every page, which also links to local information about the other local towns in North-west Murcia. More info about Bullas is available in the Bullas section, accessed via the map box at the bottom of every page.